Every year, the UN SDG Action Awards recognize individuals, civil society organizations, subnational governments, foundations, networks, private sector leaders who are advancing the global movement for the Sustainable Development Goals in the most transformative, impactful and innovative way. To meet the SDGs we need everyone to take action. We are calling for the top mobilizers, storytellers, campaigners, connectors, visualizers, includers and creatives across the world who are making this happen! Everyone is encouraged to apply. Projects led by UN entities and national governments will be eligible for honourable mentions only. However if a government or UN project is co-organized with non-governmental partners, the partners are encouraged to apply on behalf of the project. Active participants in UN SDG Action Campaign programmes such as MYWorld, the Global Day to Act for SDGs are strongly encouraged to apply. Projects that have been closely co-developed with the UN SDG Action Campaign or as part of a signed partnership agreement with the Campaign would not be considered eligible. If you are unsure whether you are eligible, please contact us. 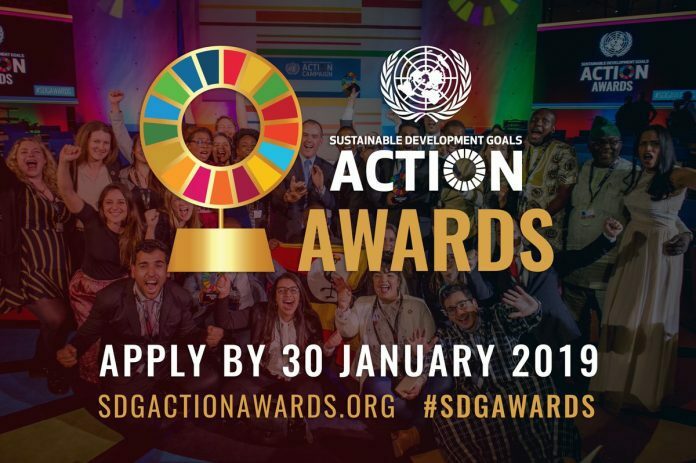 Winners are presented at a breathtaking Awards Ceremony on the first night of the Global Festival of Action for Sustainable Development and their initiatives and projects highlighted throughout the year as an inspiration and role model to the growing global community of SDG leaders, decision-makers and influencers. Mobilizer: The project/team that demonstrates the greatest successes with mobilizing individuals, volunteers or networks for collective action for the SDGs. Storyteller: The most impactful or innovative project to capture powerful human stories to help communicate the interconnectedness of the SDGs in people’s lives through different mediums. Campaigner: The most impactful or innovative communications campaign (local/national/international) to raise public awareness about the SDGs and/or people’s role in SDG action. Connector: The team/project that demonstrates innovative or impactful ways to engage multiple stakeholders or build networks to generate the transformational change needed to make the SDGs a reality. Includer: The project/group that makes the most innovative and impactful effort to ensure that excluded groups become part of the SDG dialogue and decision making in their community or at international levels.